This is the third time that I have reported to the membership on the state of the congregation, and what I said in 2013 and 2014 holds true for 2015: The state of our congregation is strong. To be clear, over the last three years that I have had the honor of serving as president of Adas Emuno, we have faced a number of difficulties, we continue to face some very real challenges in the present, and no doubt will need to face new ones in the future. But we are strong because we are facing up to those difficulties and challenges. We are strong because we have been solving problems and making progress on many fronts. And most of all, we are strong because of the talent, the skills, the caring, and above all the dedication of our amazing little community, our assembly of the faithful. One year ago, our most pressing concern was our religious school, and the Board of Trustees made it our highest priority to make sure it had the kind of leadership that our congregation, our members, and above all our children deserve. Traditionally, Adas Emuno has had three key part time positions, that of Rabbi and Cantor, our clergy, and the third being our Religious School Director. On the suggestion of Rabbi Schwartz, we decided to combine the positions of Cantor and Religious School Director, and conducted a search for a Cantor-Educator, the title now used for such a combined position. 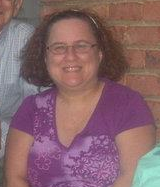 The search concluded successfully, and Cantor Sandy Horowitz became our new Cantor-Educator last July. I want to make it clear that the Board had great confidence in Cantor Horowitz's ability to take on the role of Religious School Director, but as the saying goes, the proof is in the pudding. So it is only now, with the completion of the 2014-2015 school year, that I can say for a fact that our confidence was not misplaced, that Cantor Horowitz has proven to be a splendid Religious School Director, and for the first time in recent memory we have been able to find the right balance between maintaining a warm and welcoming atmosphere for our school and providing our students with the quality of academic instruction that they need. I should add that credit also goes to our dedicated teachers, teacher's aides, and parent volunteers, and our Religious School Committee, co-chaired by Elka Oliver and Michael Raskin this past year. Of course, Cantor Horowitz was hired to be our cantor as well as Religious School Director, and the combined role of Cantor-Educator was meant to bring some stability to what had been a juggling act of student cantors, cantorial soloists, and b'nai mitzvah tutors coming and going each year. In this regard as well, what had been a problem in previous years was no longer a problem this past year. And anyone who knows Adas Emuno knows that our congregation has pretty high musical standards, and so it is particularly gratifying to know that Cantor Horowitz has not only met those standards, much to our membership's satisfaction, but has in fact exceeded them. And so, I want to take this opportunity to say thank you to Cantor Horowitz, who has poured her heart and soul, and many more hours of work than she anticipated, into our congregation. I have referred to our clergy as a dream team, and I know that our membership is quite familiar with our Rabbi, Barry Schwartz, and we are very grateful for the many gifts he brings to our congregation, for his intellectual acumen, for his talent as a teacher and educator, for his dedication to social action, for his devotion as a caretaker (often in ways unnoticed and unacknowledged) of our shul, as an advisor and counselor, and above all, as our spiritual leader. I want to take this opportunity to say thank you, Rabbi Schwartz, for all that you do, and to let you know how much you mean to us. And in the past I have neglected to mention Debbie Schwartz, our rebbetzin, but I think that she deserves a word of thanks as well. For the past year, from the High Holy Days through to Shavuot, on every Friday evening, on Saturday morning B'nai Mitzvah services and Torah Study sessions, and on Sunday morning Religious School model services, we have been enjoyed a quality of clergy leadership that is nothing short of exemplary. Credit also goes to the work of the Ritual Committee, chaired this past year by Virginia Gitter. And looking towards the future, I am very pleased to report to you that this past year both Rabbi Schwartz and Cantor Horowitz have signed multi-year contracts that take effect this July, so that we can look forward to continued stability and continuity in the coming years. Following the membership's approval of our amended By-Laws last year, we were able to expand our Board of Trustees, and we have been especially invigorated by the addition of several new board members, including Sandra Zornek, Jody Pugach, Susan Grey, and Judith Fisher, all of whom are religious school parents. Last year, two other board members took over as officers of our congregation, Elka Oliver as Vice-President, and Marilyn Katz as Recording Secretary. It has been a real pleasure working with all of them, as well as with our longstanding board members, past president Virginia Gitter, Michael Raskin, Annette DeMarco, Norman Rosen, Lauren Rowland, our Financial Secretary Mark Rosenberg, our Treasurer Michael Fishbein, and Doris White who serves as our bookkeeper. Thank you all for your continued service to Adas Emuno. And thank you as well to Fred Friedman, who stepped down from the board during the past year. We had the opportunity to honor Fred at a special Shabbat service on May 1st, which turned out to be a truly memorable and moving evening, but it doesn't hurt to say thank you, once again, on behalf of our congregation. I would like to mention some of the new initiatives and special events that took place over the past year. For example, we had an Adas Emuno Religious School Family Meet and Greet last August, and then in September we launched our innovative new Tot Mitzvah program, led by Doris White. We also launched our Poetry Garden group last summer, meeting once a month in the Adas Emuno garden when the weather was warm and dry, in our sukkah during the Sukkot festival week, and in the social hall the rest of the time. I want to thank Doris White again for helping to lead the group, and note that, apart from its own merits, it can serve as a model for other special interest groups within the congregation to set up regular meetings. You don't need a large group to make it happen; in fact a small group works best. And speaking of groups that meet in the social hall, we play host to the Bergen County Chapter of the American Recorder Society, letting them use our social hall each month for a nominal fee, and they treated us to a marvelous outdoor concert in our garden last September. Hopefully, we can make this an annual event. Our tradition of hosting wonderful musical events continued this past May with the return of Eugene Marlow's Heritage Ensemble. This past year we enjoyed many fine Adult Education programs, thanks to the efforts of committee chair Norman Rosen, and his co-chair Fred Friedman, and it would be too much to mention all of the events they organized here. Instead, for my part, I just want to note that we had some seasonal fun on November 1st with a screening and discussion of the feature film, World War Z, and on April 11th with a screening of the documentary, The Internet's Own Boy: The Story of Aaron Swartz, which was followed by a very lively discussion and debate. I believe that the format combining film screenings with discussions is one that works very well for us. One of the high points of this past year was the return of Adas Emuno Has Talent, which serves as a fundraiser for our Religious School. As was the case the first time we held this event in 2013, this past January's talent show was a marvelous showcase for the gifts of our membership, young and old alike. Special thanks go to Elka Oliver for her leadership in organizing this event. I have to say that it was a personal thrill for me to be able to write an original Purim spiel that, if nothing else, saved us the cost of purchasing one from someone else, as we've done in previous years, and to have it performed not once, but twice. Thank you again to our clergy and Ritual Committee for expanding our celebration of this joyous holiday, and while it may need some tweaking, I think the idea of performing the spiel twice, once on a Sunday morning for the Religious School, and once as part of an evening Purim service, is a good one. I also hope that we can make "The Schnook of Esther" available for purchase to other congregations, to maybe raise a few extra dollars for our social action fund. And thank you to Elka Oliver and Virginia Gitter for organizing and directing this year's production. Speaking of Virginia, when she initially proposed bringing back our congregational Seder on the second night of Passover, she met with some resistance and negative feedback, or at least some misgivings about the feasibility of the event. She listened to the comments, acknowledged them, and proceeded to organize the event anyway, and it turned out to be a great success! One of the questions raised was whether enough people would be interested in and willing to attend a congregational Seder, and it turned out that we had to turn people away. Another question was the cost, but Virginia worked out a way to keep it reasonable. And the third was whether the Seder itself would be well organized and meaningful, and as led by Rabbi Schwartz, it most certainly was. So thank you again to our Rabbi, and thank you to Virginia for your vision, and your willingness to see it through! At this point, I would like to acknowledge the hard work of the chair of our Social Action Committee, Annette DeMarco, and emphasize how important our social action initiatives are for Adas Emuno. And I must acknowledge the chair of our Buildings and Grounds Committee, Michael Fishbein, for his work regarding the repair, maintenance, and improvements of our facilities. I also want to say thank you, on behalf of the congregation to Fred Cohen for his continued work on our garden, and to Richard Allichio for his volunteer work on behalf of our events and fundraisers. Regarding publicity, again Virginia Gitter deserves our gratitude for her work on the newsletter and mailings, as does Lauren Rowland. As for our transition to a new website and database service, this is an area in which we have not performed as well as we should have, and I regret the delays, and take responsibility for them, the president being the goalie whose job it is stop the buck right here. I am very grateful to Mark Rosenberg for his work with the ShulCloud service, and to Sandra Zornek for picking up the ball that others have dropped, and taking us to the point where we are almost ready to roll out the new system. Expect to hear more about it later this summer. I'll just add that I've been doing my best to maintain our congregational blog, which serves as something of a record of our activities as well as publicity for Adas Emuno, and I would welcome others to contribute to it as well. I also want to mention that I have been writing occasional op-eds for our local periodical, the Jewish Standard, and the primary reason I'm doing so is that each piece includes an author blurb that identifies my association with Adas Emuno, and thereby gives us a little bit of extra publicity. Two important policy initiatives were completed this year that bear mentioning. One was the development of our new Safe Child Policy for our religious school, an effort led by Elka Oliver. Another was the establishment of a new Family Service and B'nai Mitzvah Service Attendance Policy, the product of extensive discussions on the part of the board, Rabbi Schwartz, and Cantor Horowitz. I began this report by acknowledging that we do face some serious challenges, and I would be remiss if I did not identify them to you. The way I see it, there are three main challenges, and I think it would be helpful to review them in order of priority. The first and most important challenge is membership. Congregation Adas Emuno is its membership. We are a nonprofit corporation, yes, but at the core we are an assembly of the faithful (that's what adas emuno means), we are a community, we are a congregation. And our membership has been in decline, partly due to better bookkeeping, but also in real terms. We face demographic challenges regarding the Jewish population in this area, as well as challenges that are shared by congregations of other faiths and traditions. In the past, it was sufficient to take the attitude that, if you build it, they will come, but that is no longer the case, and we need to put more effort into outreach, and to reach out to areas beyond Leonia and the towns that immediately surround us. The challenge of membership is one both of recruitment and also retainment, and in that regard, we as the leadership of the congregation need to do a better job of communicating with our membership, and of listening to what our members have to say. At the same time, I want to renew my plea to our members, to keep in mind that this is a do-it-yourself temple, that we welcome, indeed need your input and participation, in all aspects of our synagogue's life. If there's something we're not doing, or something that we could do better, please, by all means, let us know, but also let us know what you are willing to do to help out. And as I've mentioned before, please remember to be an Adas Emuno ambassador, and help us to bring in more members. The second challenge that we face, one that is related to the first, is declining enrollments in our religious school. We can still survive for an extended period of time with declining enrollments, and in theory we can survive indefinitely without a religious school altogether. But what we have seen happening with our sister shuls is that when a congregation closes its religious school, it will eventually close its doors as well. The two may be separated by many years, even by a decade or two, but the long term health of our congregation can be measured by the health of our religious school. Moreover, religious education for our children, including b'nai mitzvah preparation, is at the heart of our mission as a synagogue. As I have noted, the Adas Emuno Religious School is now in the best shape that it has ever been, so now is the time to get the word out, to do more in the way active recruitment. Our third major challenge is financial. This is related, in part, to declining membership, which means a decline in membership dues. It is offset by declining religious school enrollments, because tuition does not completely cover the costs of the school, but subsidizing our children's education is a longstanding policy of our congregation. For the short term, we are in good shape financially, given our three properties and savings. But we are spending more than we take in from dues, fees, tuition and donations. In part, this has been due to the need to deal with maintenance and repairs that were put off during leaner financial times. 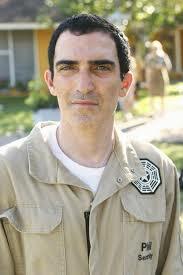 We also have been dealing with personnel changes that only now have become stabilized and predictable. Obviously, we cannot continue to spend more than we earn indefinitely, so we need to arrive at a financial formula that works for us. For this reason, the board has approved the raising of dues and tuition for the coming year. The decision was a difficult one for the board, with the impact on membership an important concern. I want to emphasize, however, that the raises are modest, and that we have avoided raising dues and fees for the past several years, for reasons that include concern over the country's economic downturn. But the board recognizes the importance of a balanced budget, and it remains a fact that we are still a bargain compared to other temples in the area. We are also looking into ways to increase our fundraising efforts, which have included the use of the Benefit smartphone app and the Blue Moon Mexican Café Community Night last month, thanks to Sandra Zornek. And to echo Susan Grey's Yom Kippur Appeal, "Please consider giving generously this year to sustain the special life we have created here at Adas Emuno." Of course, we are also looking into ways of cutting costs. And unlike many of our sister shuls who are also dealing with the same problems regarding membership, enrollments, and finances, as a small congregation we do not have the high overhead they do, in regard to staff, maintenance of facilities, etc., so we go into this new financial climate already lean and mean. That is why we ask for less in the way of dues and tuition. But still, it is important to recognize our fiduciary obligations. The bottom line, however, is that our finances have to be a lower priority than our school, and our membership, and we need to spend money, prudently of course, in our efforts to increase our enrollments and our membership. People come first. Our shul cannot survive with money and no members, and our school cannot survive with money and no students. But it is possible to survive with members and students, even without much in the way of financial resources. My intent is not to convey a sense of doom and gloom, but rather to explain why I would prioritize membership above all, followed by our religious school, and only then followed by financials. And in setting up this hierarchy of needs, I don't mean it as an absolute, but rather as a suggestion that can guide us in making decisions for the future. I also want to emphasize that, in noting how we are experiencing declines in membership and enrollment, that they have been gradual, and that they are, in my opinion, reversible. We have a truly exceptional congregation, everyone who experiences it says so. We have every reason to be proud of what we have here, to be proud of what we have achieved here, to be proud of what we are. And we have every reason to do all that we can to insure that this extraordinary legacy that we have inherited from others who came before us can be passed down to future generations. We are now a little more than six short years from our sesquicentennial, the 150th anniversary of the founding of Congregation Adas Emuno. Let us look forward to celebrating that milestone with a congregation that is stronger than ever. And in the words derived from the Psalms, May Congregation Adas Emuno go from strength to strength. 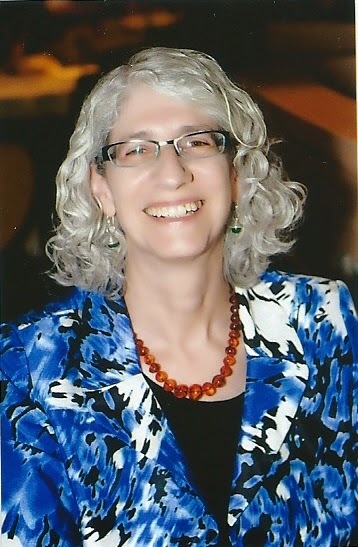 At our annual congregational meeting, held this year on June 25th, Cantor Horowitz delivered her first report to our membership, having completed her first year with us in the dual roles of Cantor and Religious School Director. To the delight of everyone in attendance, Cantor Horowitz delivered her report in a musical fashion, an unexpected but entirely appropriate delight. It's so nice to be here. For almost exactly a year…. Rabbi and School Board and Prez. Without the help of everyone. And the honor of being able to sing in the Talent show. I even composed some songs for the children. The students seemed happy as they learned. Thank you to the parents–for all your help. They encountered the Torah and they learned from it! And they made us proud. They are our greatest hope, for the future of our people. Come for pizza and make-your-own ice cream sundaes! Meet our clergy, Religious School Director, board members and other families. Fun for the kids and a great time to register for Religious School. We are a warm and welcoming Reform synagogue serving the northern Hudson and eastern Bergen County areas. serving grades Kindergarten through Confirmation. In our last post, Honoring Fred Friedman, we related how Adas Emuno set aside Friday evening, May 1st, as a special Shabbat to show our appreciation for Fred Friedman's service to the congregation and Jewish community, as well as the local community here in Bergen County. And that evening, in lieu of the rabbi's sermon, Fred was given the opportunity to come up to the pulpit and tell his story. Just a few weeks earlier, during the Shabbat evening service on April 17th, Fred's wife Maren shared her remarkable story of survival in conjunction with our observance of Yom HaShoah, Holocaust Remembrance Day. Maren allowed us to publish her talk here on our congregational blog, which appeared in a post entitled Maren Friedman's Yom HaShoah Story. First of all, I want to thank my friends on the Board and the Rabbi for this unexpected honor. I am delighted and proud. When I first heard of the plan for this evening I thought, “why me?” And that night as I was going to sleep I started to wonder, “How, as I approach my 84th year, did I get here? Well, the short answer would be “by boat”. But that’s not quite the story. By “get here” I mean how did I come to be a practicing Reform Jew, the President of my previous Congregation and a Board member of Adas Emuno. There was no Jewish experience in my first seven years, no Seders, no synagogue, no High Holy Days, nothing! My family going back at least 3 generations were totally assimilated German Jews. I was born Fritz Bernard Friedmann in Wurzburg Germany in 1931. My father was a lawyer. My mother was a trained kindergarten teacher. When Hitler came to power one of his first acts was to forbid Jews to practice law. That took away my fathers profession, probably his self respect and made earning a living ultimately impossible as more such restrictions came about. It led to my father's suicide in January 1938. My mother and I moved in with my grandmother until July 1938, when mother and I left for England to join her brother and his family who had emigrated to the UK in the mid 1930s. Mom stayed in England for a week or so and left for America in order to find work and get established. I stayed behind and finally sailed alone to New York in October 1938. I was seven years old. I was a very happy kid. I was finally going to join my mother again! Early on the morning of October 29th, I was woken up and taken on deck to see the Statue of Liberty and New York. The view was astounding. But it took second place to the thought of being together with my mother after our many months of separation. I remember the passport and customs lines and formalities. Finally by noon I was ready, and waited for my mother to come. I waited and waited and waited some more, miserable and sobbing. By 5 PM I was the only passenger left, and the staff was about to turn me over to the police for safekeeping when my mother finally arrived. She had gotten the time wrong. That began some 4 1/2 years of disappointment and separation. Mother’s training enabled her to get a job as a sleep in baby nurse with a wealthy Park Avenue family There was no place for me. I was put in a foster home with the Oppenheimers, refugees like us who lived in Valley Stream, Long Island. I would be able to see my mother only on Sundays, her one day off. That was very far from the hopes and expectations of life with mother that I had when I boarded the ship “Deutschland” in Soutampton ten days earlier. The Oppenheimers were kind, and in retrospect as good as foster parents could be. But a foster home was not what I wanted. I wanted a home with mother, like other kids. A four or five hour visit once a week was tough to deal with. I spent a lot of nights crying myself to sleep. Money was scarce, of course. A birthday meant new socks or underwear. Everything else was hand me down. I had to earn my own spending money. I sold the Saturday Evening Post and Ladies Home Journal door to door, and in Valley Stream State Park. The money I earned was small but gave me some spending money like my friends who got allowances. And you got points for selling magazines. They could be redeemed for toys. That’s how I got my crystal radio set that allowed me to listen to radio programs under the covers at night when I was supposed to be asleep. I learned to speak English properly listening to that little crystal set. Tommy Hayes, the school principal's son, and I became friends and I was often invited to the Hayes's home after school. That was an all-American family in my eyes—right out of Norman Rockwell. It was my first experience of what an American home and family could be like. I liked it a lot and vowed that if I could, my adult life would be like the Hayes's life, and my kids would not have to repeat the life I was living. I also got my first Jewish experience with the Oppenheimers. They were Conservative Jews who kept a kosher home, went to synagogue, and sent me to Sunday school. They celebrated the Jewish holidays, a new experience for me. In Germany the only way I found out that I was Jewish was the Juden Verboten (Jews Forbidden) signs at hotels and restaurants and shops. I wasn’t allowed in a German school when the time came. I had to go to a Jewish school. The irony was that I was a towheaded blond kid with blue-green eyes who looked German. So much so that at parades, policemen and soldiers would hoist me on their shoulders so that I could see over the crowd. It gave my mother much mirth to see her Jewish son taken for a real German boy by the Nazis. When I was nearly twelve my mother started work as a kindergarten teacher in a small New York nursery school. And when the owner wanted to retire my mother was able to buy the school with the money she had been able to save over 5 years of hard work. I was able to leave the foster home and live with my mother in the nursery school apartment. She slept in the living room. I had a small bathroom sized room just big enough for a small bed, a desk and a chair. And so, my life as a more normal American kid began. And so did my Jewish life. Although my mother was not a practicing Jew nor a believer, she wanted me to have Jewish background, and I was Bar Mitzvah at a Reform congregation. That wasn’t important to me at age 13. But when I became an adult, met my wonderful wife Maren, and had a family, Jewishness became IMPORTANT (in capital letters)! We wanted our kids to be Jewish. And they are. And so are our six grandchildren who range from Shomer Shabbos to very Reform. In spite of my beginnings, Judaism triumphed, became a meaningful part of my life, and brings me great joy. Who would have thought it, 84 years ago? From Fritz to Fred. It’s been a hell of an interesting journey! I wouldn’t have missed it for all the world! 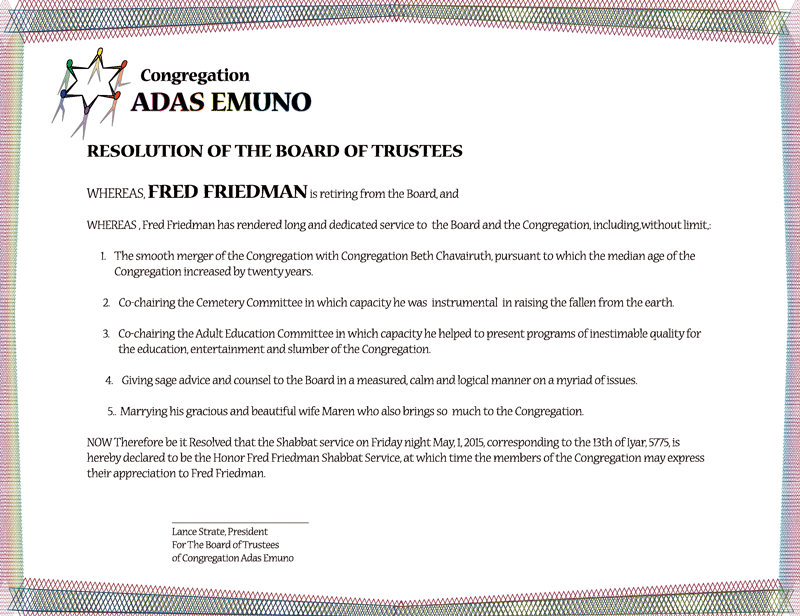 At our Shabbat service on Friday evening, May 1st, Congregation Adas Emuno honored Fred Friedman, who had stepped down as a member of our Board of Trustees this past winter. Now, if you look closely at the wording of our resolution and that of these other certificates, you'll see that a certain resolution-gate scandal emerged from the proceedings. But it was all taken in good humor, and it was indeed an evening to remember, not the least because of the remarks Fred delivered, telling his own story. And we will share those remarks with you as well... in our next post! Stay tuned! That line was uttered during the two-part season finale of the ABC television network’s popular series Once Upon a Time, which aired on May 10. It was a little inside joke inserted by series creators Edward Kitsis and Adam Horowitz, who co-wrote the episode; both of them may well have received fountain pens as gifts for their own bar mitzvahs. There was a time when a fancy fountain pen was as commonplace a gift as savings bonds for bar mitzvah boys, so much so that an often repeated bar mitzvah joke was, “Today I am a fountain pen.” (This was a play on the cliché declaration “Today I am a man,” this being a time before the bat mitzvah was fully instituted as an egalitarian religious practice.) Michael Hilton, in his book Bar Mitzvah: A History, reports that “in July 1946, Barry Vine of New Haven Connecticut, received sixteen fountain pens as gifts”! Now that’s the write stuff! 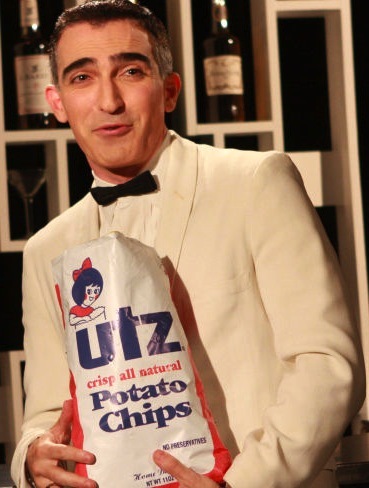 Once Upon a Time’s bar mitzvah boy was played by the actor Patrick Fischler, who perhaps is best known for his role as the Jewish comedian Jimmy Barrett on the recently concluded AMC series Mad Men, and who also appeared on the series Lost, a series that Kitsis and Horowitz previously had worked on as writers. 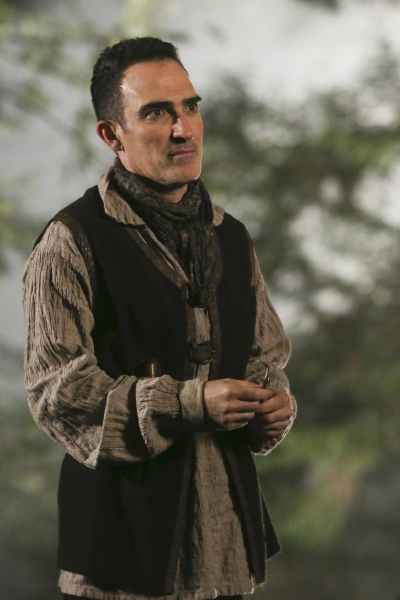 Fischler’s character was introduced in March, during the final story arc of the series’ fourth season, first through references to a mysterious “Author” whose writings set the course of the series’ storybook characters, such as Snow White, Prince Charming, Rumpelstiltskin, Captain Hook, Robin Hood, Maleficent, and Regina (aka the Evil Queen, Snow White’s nemesis); as “The Author” he also had the power to rewrite their stories, and change their fate. By the end of the season, we learned that the “Author” is a title and status that has been bestowed upon many different people, that this particular Author is named Isaac, that his last name is Heller (possibly a tribute to Jewish novelist Joseph Heller of Catch-22 fame), that he was from Brooklyn, and that back in 1966 he was a novelist who was having great difficulty getting anything published, working to support himself selling television sets, a job at which he was also unsuccessful. Selected to become the next in a long line of magical authors, he is asked to select a pen to use, prompting his remark about his bar mitzvah. Although that comment was the only instance in which the character was directly identified as Jewish, his name, voice, place of birth, look, and manner all allude to his ethnicity, and presumably his religion. Part of the humor of the bar mitzvah comment comes from the incongruity of inserting a bit of Yiddishkeit into a series that remixes characters from Disney’s animated films, most of whom are derived from European fairytales and folklore. (Disney owns Once Upon a Time’s television network, ABC.) After all, even during the two decades that Michael Eisner was CEO of the Walt Disney Company, the film studio added no characters to its pantheon like Fievel Mousekewitz of Stephen Spielberg’s An American Tail. And we certainly don’t expect to see anyone named Cohen or Levy in Cinderella, Peter Pan, Beauty and the Beast, or Frozen. No doubt there also was a degree of identification between Kitsis and Horowitz, as the creators of Once Upon a Time, and their character, Isaac Heller, as “The Author” of the storybook tales that seal the fate of the series’ heroes and villains. And perhaps making Heller a villain involved a bit of self-deprecating humor. Certainly, it was ironic that Isaac’s status as “The Author” is revoked for changing the heroes’ and villains’ stories. That is exactly what Kitsis and Horowitz have done in the series, not the least by making both types of characters less black and white, more morally ambiguous, and therefore more realistic. Still, portraying Once Upon a Time’s only Jewish character as a villain is more than a little problematic. There are echoes of Shakespeare’s Shylock in the explanation that Isaac gives to Snow White and Prince Charming, that it was “a lifetime of bad bosses” who “fancy themselves heroes, pushing around people like me,” that led him to resent the heroes and identify with the villains. The problem with having only one Jewish character in a popular narrative is that the character’s Jewishness becomes more than an individual attribute. Instead, the character becomes a representation of the Jewish people as a whole, in this case a negative representation, indeed, a negative stereotype. But there is nothing negative about the Jewish connection to the role of “The Author” after all. On Rosh Hashanah and Yom Kippur, we pray that we may be inscribed in the Book of Life for a good year, and we wish the same for others. In our tradition, God is an author, indeed, The Author, an understanding that has been adopted by the other Abrahamic religions. Of course Moses, our greatest prophet, was also a writer, and through the Torah and the Tanach, we became the first people to write our own historical narrative. And the stories our ancestors wrote have changed the course of history for the entire world, and continue to capture the imagination of billions of people. Upon doing a search for “Jewish authors” via Google, a listing of “authors frequently mentioned on the web” appeared, and cited 50 names, including Phillip Roth, Saul Bellow, Franz Kafka, Bernard Malamud, Sholem Aleichem, Anne Frank, Joseph Heller, Isaac Asimov, J. D. Salinger, Elie Wiesel, Isaak Babel, Ayn Rand, Primo Levi, Marcel Proust, E. L. Doctorow, Amos Oz, Arthur Koestler, Leonard Cohen, Theodor Herzl, Ruth Prawer Jhabvala, Gertrude Stein, Emma Lazarus, Art Spiegelman, Tony Kushner, and Boris Pasternak. No doubt a full listing of every Jewish novelist, short story writer, poet, playwright, screenwriter, comics writer, and writer of nonfiction would strain even the Google search engine’s enormous capabilities. Interestingly enough, Google’s list also included King David, Josephus, Maimonides, and Paul the Apostle, and it is certainly worth noting in this context that the Christian Gospels are to a large extent the product of Jewish authors, their impact immeasurable. So maybe a fountain pen isn’t all that terrible a gift to give on the occasion of a bar or bat mitzvah? Certainly, research indicates that in the classroom, learning and retention is greater for students who take notes by hand as opposed to on laptops and tablets, and there is much to be said for taking pen in hand in regard to creativity. 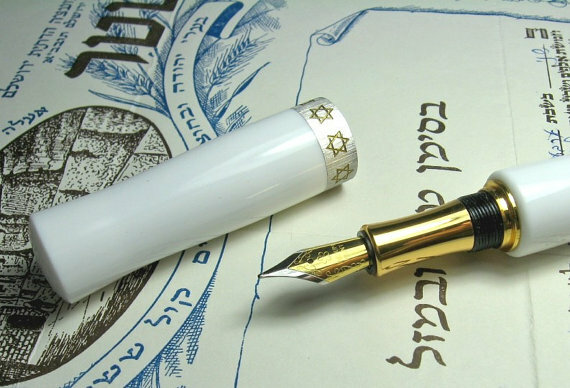 Our tradition of writing extends from Torah and Tanach to Talmud and Zohar, from Maimonides and Karo to the writings of our modern rabbis and lay leaders, from the Reform, Conservative, and Reconstructionist branches as well as the Orthodox, and to the secular, scholarly, popular, and artistic works of Jewish authors all around the world. With the magic of the pen, we can continue to be authors of our own history as a people. And with the magic of the pen, we can inscribe our own names into a personal book of life that we each can write for ourselves.